iKON is set to present a stage where fans can sing along “Love Scenario” in return for the tremendous popularity its smash hit has received, especially from kindergarteners and elementary schoolers. 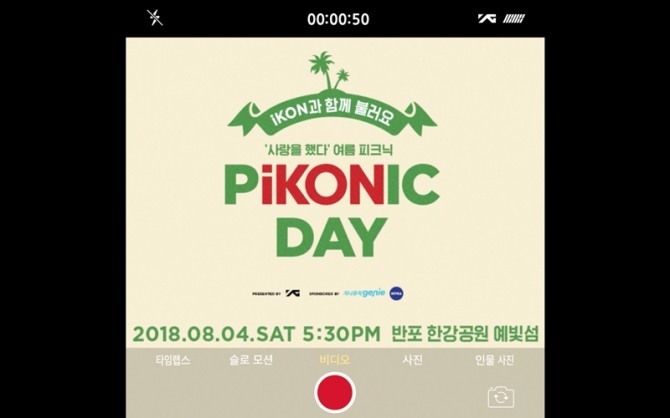 On Wednesday, the act’s agency YG Entertainment announced that a family picnic festival “Pikonic Day” will be held at Some Yevit, one of the man-made floating islands at Banpo Hangang Park, on Aug. 4 at 5:30 p.m. The upcoming event, which includes family events and programs, has been planned to reciprocate fans’ strong support for iKON’s “Love Scenario,” according to the agency. The act will perform a special stage at the event, while visitors can enjoy the festival for free. Photos and videos are allowed as well. The song, a lead track from iKON’s second full-length album “Return” released earlier in January, has been making waves among young listeners due to its easy-to-follow melodies and lyrics. Some elementary schools have even started banning the song in classrooms as students wouldn’t stop chanting the song. The song had debuted atop major local music charts upon its release. iKON is gearing up for a comeback with its new EP “New Kids: Continue,” slated for release on Aug. 2.